I’ve picked up a hobby between book writing. 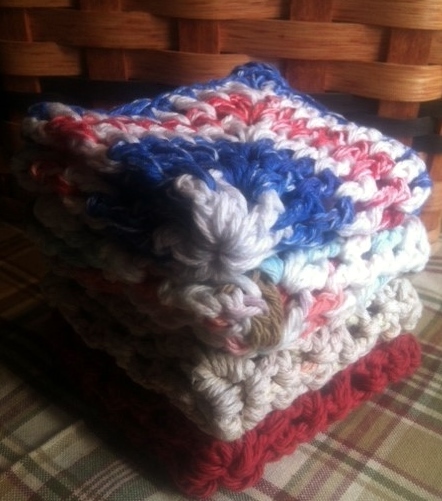 So far, I have crocheted a stack of dish cloths. They are 100% cotton, which I love. They are machine washable and dryable. I appreciate the pattern because it provides texture, which is always helpful when cleaning up messes or hand washing dishes. Did I mention, they are easy to make? Isn’t that a plus? They make great gifts, which is why I’ve needed to make more since my prior post. Ch 3 (counts as dc). (Ch 2, 4 dc) 3 times in ring. Ch 2. Join with sl st to top of ch 3. Ch 3 (counts as dc). 1dc in each of next 3 dc (2 dc, ch 2, 2 dc) in next ch-2 space. *1 dc in each of the next 4 dc (2 dc, ch 2, 2 dc) in next ch-2 space. Repeat from * twice more. join with sl st to top of ch 3. Ch 3 (counts as dc). *1 dc in each dc to next ch-2 space (2 dc, ch 2, 2 dc) in next ch-2 space. Repeat from * 3 times more. 1 dc in each dc to end of round. Join with sl st to top of ch 3. Ch 1. 1 sc in each dc around, having 3 sc in corner ch-2 spaces. Join with sl st to first sc. Fasten off. Next, I plan to delve into place mats, followed by throw rugs. If you know of some great (and simple) patterns, let me know. I love these!! I pinned it on Pinterest. I especially like the colors!! I hope you did link back to the blog. Thank you! I plan to post more of these projects in the near future. There are several websites that offer free crochet patterns. Here are a few of the vintage crochet pattern websites. The vintage patterns seem to have more original designs, though at times the patterns are a little difficult to follow. There are many choices for dishcloths, bedspreads, placements and such all in one place. My personal favorite is Free Vintage Crochet. When I first learned how to crochet I used a book that my mother owned. It was a hard cover book that probably dated back to the mid or early 1950’s. I wish I had that book on hand. It would most likely be considered vintage. 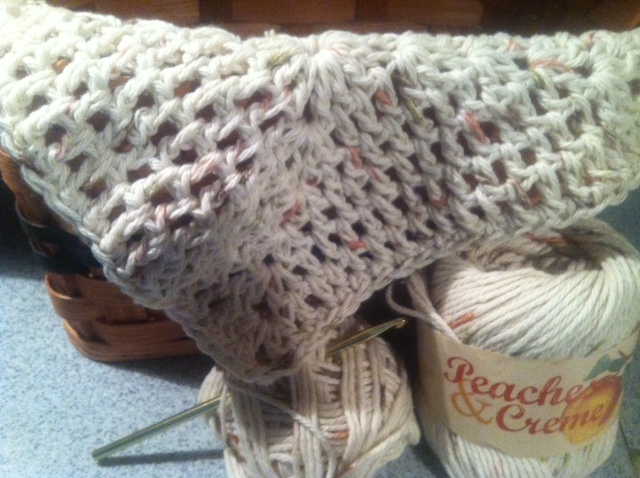 I went to the first link that you listed, http://www.freevintagecrochet.com. I looked at a few patterns, including some for hot plates hot plates (a project that I will be working on out of need). I also saw a tab for How To Crochet. 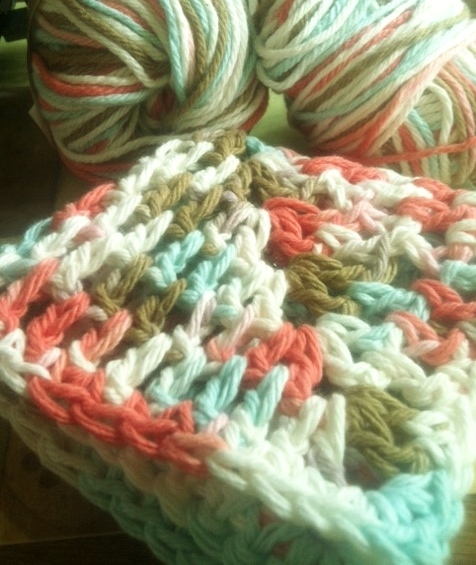 For anyone that doesn’t know how, simple patterns are not difficult…crocheting can be easy. Check it out! Thank you for the links, Marian. They are truly appreciated! I wanted to post you this little bit of word in order to say thanks a lot once again with your marvelous tactics you have contributed on this site. This has been so strangely open-handed with people like you in giving publicly what exactly a few people might have advertised as an e book to help make some money for their own end, principally considering the fact that you might have tried it in the event you considered necessary. These techniques in addition acted like the fantastic way to be certain that other people have the identical keenness much like mine to know the truth way more concerning this issue. I am sure there are thousands of more enjoyable times in the future for many who examine your blog post.